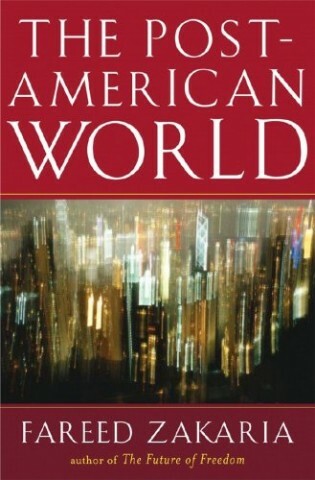 This morning I finished the unabridged audio edition of The Post American World, written and read by Fareed Zakaria. No review of this book should begin wtithout noting that it is misnamed. Zakaria argues that American hegemony, agenda-setting, and dominance in nearly every field of power will continue for the forseeable future. Likewise, the title of Chapter 1 (which appears to have been an alternative working title), “The Rise of the Rest,” is also misnamed: Zakaria focuses on the United States, India, and China. So think of this book as The Rise of a World Dominated by India, China, and especially the United States, the The Lexus and the Olive Tree: Results Section, or, as one blogger suggests, even The Post-Unipolar Hegemonic American Worlds. It’s a pretty good book. World does a lot of things right. The starting position, opportunities, and risks for the United States, China, and India are outlined in some detail. China’s good governance, India’s low starting point, and the United States economy and culture are all world-conquering strengths. Likewise, Zakaria describes familiar themes in new ways. The law U.S. savings rate (0%) is discussed as the low household U.S. Savings right… if you factor in private savings held by corporations, the savings rate is at historical levels. Likewise, national healthcare is implied to be a solution to U.S. fear of globalization: in no other major economy does losing a job mean losing your health. Some things are gotten wrong, as well. These may be classified as (a) brute facts or (b) fashionable biases. The brute facts can be embarrasing to listen to, and the National Review (apparently angered by his title) has been calling him out on them. From implied American decline to the Ferris wheel index, some of Zakaria’s claims are either pulled out of the air or deceptively stated. Even worse is where Zakaria tries to fit into polite liberal society. Some of the errors here are all the more galling, as a simple email to his Harvard classmate may have resolved them. Zakaria attacks AFRICOM (the Pentagon’s new policy in no longer trying to run itself in Africa as it does in Europe) as a typical military-heavy response, when AFRICOM famously has never fired a shot. Similarly, Zakaria appears to criticize U.S. policy that promises retaliation in response to terrorist attacks, by asking if we would bomb London if the next terror attack is carried out by British muslims. It’s been five years since the Core/Gap divide was talkeda bout in Esquire and twelve yars since Zones of Peace, Zones of Turmail, but Zakaria acts as if the entire world could be consiered functioning. It seems fair to say that only a multidisciplinary tapestry which weaves together historical, economic and social aspects, placed in a broader temporal and spatial framework, could add value to the knowledge base of an American target audience in regards to their own country. And so with the description and prediction out of the way Zakaria closes with prescription. Much of this seems common sense, but its validity is by necessity filtered through your norms. So I’ll just list them out and leave you to find out what he means by each…. So buy it. It’s half a step better than The Man Who Loved China., and half a step worse than The World is Flat. You’ll learn more about globalization from Fareed Zakaria’s The Post American-World. But by the time he criticzes Obama for not sufficiently demonstrating to a backwards American electorate how much better he is than all the other candidates of both parties, you will know what you’ve gotten yourself into.